For years, banks have generally accepted having risk analyses available several days after events occur. But today, financial institutions face challenges such as higher volatility, increasing interdependence of markets, growing margin pressure and increasingly complex regulatory requirements. So out of sheer economic self-interest, they need to rethink – and industrialize – how they create and process risk-related knowledge. 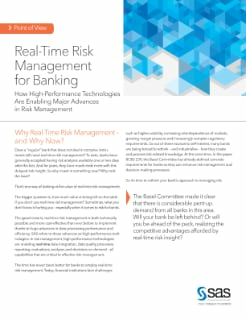 This paper discusses how real-time risk management is both technically possible and more cost effective than ever to implement thanks to huge advances in data processing performance and efficiency. High-performance technologies are enabling real-time data integration, data quality processes, reporting, evaluations, analyses and decisions on demand – all capabilities that are critical to effective risk management.